Sturgeon are pond fish and they can grow to massive sizes. They can grow up to 7-12 ft / 2-2.5 metres. They are best kept in water parameters of Ph range 6.8 – 7.5. They are great bottom feeding fish for ponds, but how big they do get they need to go in bigger size ponds. They are a none aggressive fish so can mix with most pond fish. 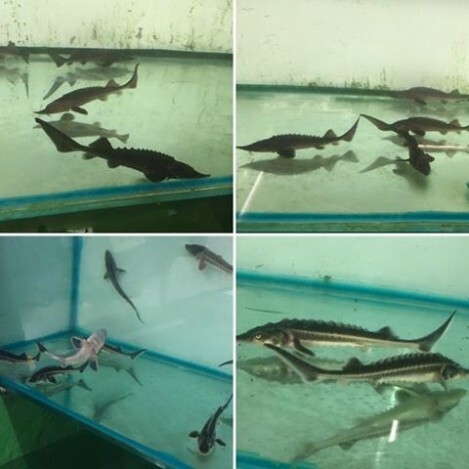 As they are a bottom feeding fish you do need to sink the food for them, they are very funny eaters so giving them some meat like blood worm every now and then is good for them, as they can lose weight quickly. As they are a dark colour they can be hard to spot against black liners, but try your best to keep an eye on them to make sure they are not getting thin. If you have blanket weed in the ponds it is recommended not to put sturgeon in your pond as they can get tangles up in the blanket weed and it can kill them. Sturgeon are a great pond fish adding something different to your out side ponds. Sturgeon are a lot more active in colder temperatures so during the winter you will still some times see the sturgeon moving about. If the weather is mile we do recommend feeding them in the winter months. Sturgeon are funny eaters they need sinking food, so make sure you feed them on sinking pond pellets. Also a treat of bloodworm is good for them. With sturgeon we recommend feeding once a day. If we have a mild winter also feed during winter but not as much.